Welcome to the podcast, "Own Your Choices Own Your Life". Your host, Marsha Vanwynsberghe is a Speaker, Life Coach, and Author of the Bestselling Book, "When She Stopped Asking Why". On this podcast, we will share the tips, tools and strategies used by our guests to breakthrough and overcome the challenges in their lives. 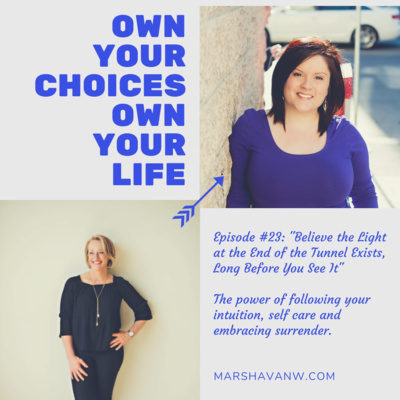 Marsha is on a mission to educate, empower and inspire you to recognize that when you truly own your choices, you own your life. 37: "Leave No Room for Doubt"
#37: “Leave No Room for Doubt” In this Monday Mindset episode we talk about the importance of leaving no room for doubt. Coming off our 4thevent, The Inspired Life Project, these incredible women felt supported in this room with other like-minded women. As soon as we leave this environment and enter back into our “normal world”, it can be challenging to not let the doubt creep back in. Today I share the 5 steps I use on a regular basis to stop the doubt spiral!! In this episode we talk about: 1. Standing on and owning your story that you keep repeating and believing. 2. The toxicity of comparison 3. The power of journaling to kick your doubts to the curb. 4. Focusing on the bigger picture, the bigger vision and who you are here to impact, support and serve. 5. Step into that role, deliver the value and own the crap out of it. Someone, somewhere is praying for a solution you have to offer them. Connect with Marsha: Book your Discovery Call: https://calendly.com/mvanwyn761 Check out my website - https://www.marshavanw.com/ Connect on Facebook -- https://www.facebook.com.marshavanwynsberghe Connect on Instagram -- https://www.instagram.com/marshavanw/ About me -- Marsha Vanwynsberghe — Author, Speaker and Life Coach Marsha is the 6 time Bestselling Author of “When She Stopped Asking Why”. She shares her lessons as a parent who dealt with teen substance abuse far past the level of normal experimentation. 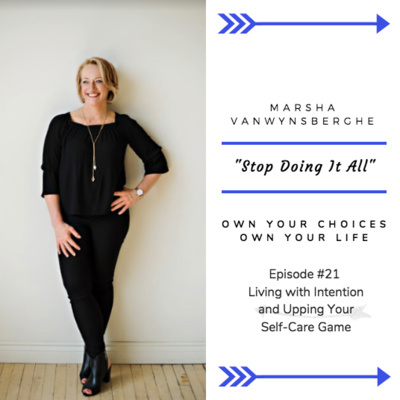 Through her programs, coaching and live events for women, Marsha is on a mission to teach you how to “Inspire Yourself Forward” in your own life. She teaches women how to own their stories, lead themselves and pay it forward to others by creating businesses that serve, support and impact others. 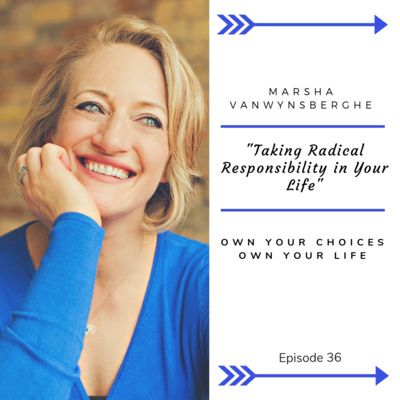 #36: “Taking Radical Responsibility in Your Life” In this Monday Mindset episode we talk about the steps to taking radical responsibility in your life. These are the first steps to creating change in your life! In this episode we talk about: 1. Deciding one area of your life you want to create change. 2. Shifting from blaming and victim mode into action mode. 3. The power your story has on keeping you stuck in your situation or circumstances. 4. Taking back your own personal power that you had all along, you just forgot how to use it. 5. Action mode, every decision takes you closer to or further away from where you want to go. Connect with Marsha: Book your Discovery Call: https://calendly.com/mvanwyn761 Check out my website - https://www.marshavanw.com/ Connect on Facebook -- https://www.facebook.com.marshavanwynsberghe Connect on Instagram -- https://www.instagram.com/marshavanw/ About me -- I am Marsha Vanwynsberghe and I am a Speaker, Coach and Author of the Bestselling Book, "When She Stopped Asking Why". I share the lessons as a parent who dealt with teen substance abuse far past the level of normal experimentation. Through my programs, coaching and live events for women (The Inspired Life Project), I am on a mission to teach others how to find their personal power by owning their story, being vulnerable and creating boundaries in their lives. I teach others the tools, tips and strategies to overcome the challenges in their lives. I am on a mission to educate, empower and inspire others to change their story and their lives by taking radical ownership of the choices in their lives. 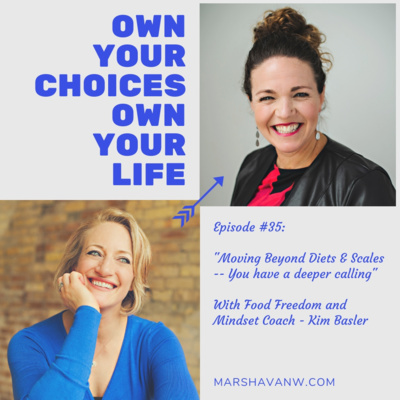 #35: "Moving Beyond Diets & Scales - You Have a Deeper Calling"
#35: “Move Beyond Diets & Scales -- You have a Deeper Calling” Kim Baster is a Food Freedom and Mindset Coach. Kim understands first-hand the struggles that come with growing up as a teenager. At the young age of 12 she was introduced to dieting and not feeling like her body was good enough. Although she began in working in the fitness industry at 16 and continues to today (27+ years later) inspiring others to live a healthy and happy life, she had her own personal struggles that suffocated her. A turning point came in her career when she could no longer keep up with the attempt to be good enough and had to leave her full time career and identify what happiness truly looks and feels like for her and not what society is telling us it should. It was time to walk the road and re-evaluate A graduate from the Institute for the Psychology of Eating in Boulder, Colorado, Kim is now actively coaching clients on developing a healthy relationship with food and body image as well as helping them get out of their own way! She addresses dietary changes and meaningful exercise routines as well as helping them discover the root of their eating and body image concerns. This opens up the door to a life with more meaning, fulfillment and happiness. She believes in sharing her story and being transparent. This opens up the space for others to find the courage to share and use the most powerful words – “me too”. Her passion to give back and inspire can also be found when she speaks with students in elementary and high school age groups about the importance of embracing oneself and nurturing a healthy self-esteem and believing in the gifts that they were born with! As well as working with women who have been trapped in diet culture and body image struggles who are begging for a way out. No more unhealthy and restrictive diets, no more body shaming or obsessive unhealthy exercise programs – one person at a time she shares her story and believes she can make a difference with the people she is fortunate to work alongside with. Kim offers Online 1:1 Coaching & Group Coaching/Workshops/Speaking engagements. Kim offers a 5 week Group Coaching Program starting later this month. Contact kim@kimbasler.com to learn more about it In this episode we talk about the 1. Learning to listen to eating cues and learning how to stop the cycle of dieting and restricting. 2. Learning to let go of feeling guilty for eating “bad” foods. 3. Learning to find the JOY in moving your body again. 4. The importance of self care in our lives. 5. The power of sharing our stories to impact and support others. Connect with Kim: https://www.kimbasler.com Facebook: https://www.facebook.com/kimbaslerfoodfreedommindsetcoach Instagram: https://www.instagram.com/kimbasler_foodfreedom Connect with Marsha: Book your Discovery Call: https://calendly.com/mvanwyn761 Check out my website - https://www.marshavanw.com/ Connect on Facebook -- https://www.facebook.com.marshavanwynsberghe Connect on Instagram -- https://www.instagram.com/marshavanw/ About me -- I am Marsha Vanwynsberghe and I am a Speaker, Coach and Author of the Bestselling Book, "When She Stopped Asking Why". I share the lessons as a parent who dealt with teen substance abuse far past the level of normal experimentation. Through her programs, coaching and live events for women, Marsha is on a mission to teach you how to “Inspire Yourself Forward” in your own life. She teaches women to build their businesses by learning how to own their stories, lead themselves and pay it forward to others. #34: "Don't Be Afraid to Re-Brand Yourself"
#34: “Don’t Be Afraid to Re-Brand Yourself” In this Monday Mindset episode we talk about re-branding ourselves. We are always growing and changing, so it seems reasonable that we expand, shift and end up re-inventing ourselves over time. Are you the same person you were 5 years ago, last year or even last month? When we allow ourselves the space to grow, we may even stumble onto a mission or a calling that speaks to us. In this episode we talk about: 1. The power of being inspired as the first step to creating change in our lives. This comes before action steps and shows us that things can be different in our lives. 2. How we all must lead ourselves in order to create change in our lives. 3. Why paying it forward is an essential for us to make a difference in this world. 4. Upcoming program changes and opportunites to work closely with me. 5. The Inspired Life Project coming up in less than 2 weeks. Connect with or work with Marsha: Book your Discovery Call: https://calendly.com/mvanwyn761 Check out my website - https://www.marshavanw.com/ Connect on Facebook -- https://www.facebook.com.marshavanwynsberghe Connect on Instagram -- https://www.instagram.com/marshavanw/ About Marsha -- Marsha is the 6 time Bestselling Author of “When She Stopped Asking Why”. She shares her lessons as a parent who dealt with teen substance abuse far past the level of normal experimentation. Through her programs, coaching and live events for women, Marsha is on a mission to teach you how to “Inspire Yourself Forward” in your own life. She teaches women how to own their stories, lead themselves and pay it forward to others by creating businesses that serve, support and impact others. Episode 33: What Can You Shift? #33: “What Can You Shift” In this Monday Mindset episode we talk about how to shift ourselves in the moment. When life feels like it keeps kicking you when you are down, when you can’t seem to catch a break, and all you want to ask is “why me?” Do you fall into this trap regularly? Is it keeping you stuck in your life? How do you break this cycle and get back into action steps to create change in your own life? . In this episode we talk about: 1. How to recognize and acknowledge that you are falling into this trap. 2. How to take ownership of your behaviour, actions and reactions. 3. How to shift your mindset, actions, reactions in the moment. 4. The power of asking the key questions, “what is this situation trying to teach me?” 5. Taking back our personal power to create change in our lives. Connect with Marsha: Book your Discovery Call: https://calendly.com/mvanwyn761 Check out my website - https://www.marshavanw.com/ Connect on Facebook -- https://www.facebook.com.marshavanwynsberghe Connect on Instagram -- https://www.instagram.com/marshavanw/ About me -- I am Marsha Vanwynsberghe and I am a Speaker, Coach and Author of the Bestselling Book, "When She Stopped Asking Why". I share the lessons as a parent who dealt with teen substance abuse far past the level of normal experimentation. Through my programs, coaching and live events for women (The Inspired Life Project), I am on a mission to teach others how to find their personal power by owning their story, being vulnerable and creating boundaries in their lives. I teach others the tools, tips and strategies to overcome the challenges in their lives. I am on a mission to educate, empower and inspire others to change their story and their lives by taking radical ownership of the choices in their lives. 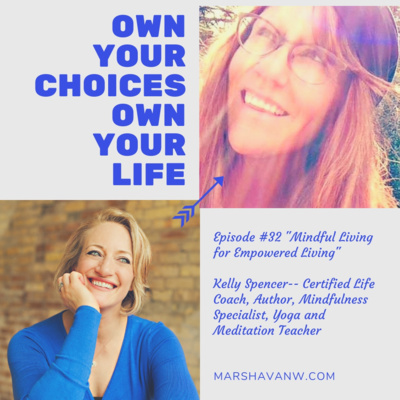 #32: “Mindful Living for Empowered Living with Kelly Spencer” Today we chat with Kelly Spencer, a Certified Life Coach, Author, Certified Yoga and Meditation teacher, Mindfulness Specialist and ex-Registered Nurse. Kelly has been a part of modern and holistic medicine for over 3 decades. She is a Yoga Teacher, Certified Life Coach and Mindfulness Specialist offering special event speaking engagements, workshops and destination retreats. She has been honored and awarded for her entrepreneurial endeavors and community service. Spencer is a published author in a variety of magazines and books and is a weekly holistic wellness columnist. As a general enthusiast of life, Kelly holds a deep desire and purpose to assist others to find their own contentment, joy and empowerment. I loved connecting with Kelly for this episode! It was two girls from Tillsonburg having a great conversation! In this episode we talk about: 1. The power of tuning in and listening to what our soul is calling us to do. 2. The power of meditation and staying in the moment. 3. We can all make a difference and an impact in this world. 4. The importance of making our health a top priority. 5. The power of following our intuition in all areas of our life. Connect with Kelly: www.kellymspencer.com www.indigolounge.ca Connect on Instagram: https://www.instagram.com/indigolounge/ Connect with Marsha: Book your Discovery Call: https://calendly.com/mvanwyn761 Check out my website - https://www.marshavanw.com/ Connect on Facebook -- https://www.facebook.com.marshavanwynsberghe Connect on Instagram -- https://www.instagram.com/marshavanw/ About me -- I am Marsha Vanwynsberghe and I am a Speaker, Coach and Author of the Bestselling Book, "When She Stopped Asking Why". I share the lessons as a parent who dealt with teen substance abuse far past the level of normal experimentation. Through my programs, coaching and live events for women (The Inspired Life Project), I am on a mission to teach others how to find their personal power by owning their story, being vulnerable and creating boundaries in their lives. I teach others the tools, tips and strategies to overcome the challenges in their lives. I am on a mission to educate, empower and inspire others to change their story and their lives by taking radical ownership of the choices in their lives. #31: "The Dangerous Trap of Comparisonitis"
#31: “The Dangerous Trap of Comparisonitis” In this Monday Mindset episode we talk about the trap of comparisonitis. Do you fall into this trap regularly? Is it keeping you stuck in your life? How do you break this cycle and get back into action steps to create change in your own life? . In this episode we talk about: 1. How to recognize and acknowledge that you are falling into this trap. 2. How living in comparison is keeping you stuck in your life. 3. 8 steps to get out of the trap of comparisionitis. 4. What we allow is what will continue 5. The power of the “telling stories” that keep us stuck. 6. Taking back our personal power to create change in our lives. Connect with Marsha: Book your Discovery Call: https://calendly.com/mvanwyn761 Check out my website - https://www.marshavanw.com/ Connect on Facebook -- https://www.facebook.com.marshavanwynsberghe Connect on Instagram -- https://www.instagram.com/marshavanw/ About me -- I am Marsha Vanwynsberghe and I am a Speaker, Coach and Author of the Bestselling Book, "When She Stopped Asking Why". I share the lessons as a parent who dealt with teen substance abuse far past the level of normal experimentation. Through my programs, coaching and live events for women (The Inspired Life Project), I am on a mission to teach others how to find their personal power by owning their story, being vulnerable and creating boundaries in their lives. I teach others the tools, tips and strategies to overcome the challenges in their lives. I am on a mission to educate, empower and inspire others to change their story and their lives by taking radical ownership of the choices in their lives. Episode #30: "Where Do You Draw Your Line?" #30: “Where Do You Draw Your Line?” In this Monday Mindset episode we talk about where is your line in the sand? Do you have a line at all? Whether it is in relationships, health, work, or in the personal areas of your life, do you tune in and decide if you are happy with where you are at, or do you let the judgments of others decide whether you are ready to create change? If there is no line in the sand, then what you allow is what will continue. In this episode we talk about the 1. The power of the line in the sane. 2. We teach others how to treat us by what we do or don’t allow in our lives. 3. What we allow is what will continue 4. The role of the fear of judgement from others in our lives. 5. Taking back our personal power to create change in our lives. Connect with Marsha: Book your Discovery Call: https://calendly.com/mvanwyn761 Check out my website - https://www.marshavanw.com/ Connect on Facebook -- https://www.facebook.com.marshavanwynsberghe Connect on Instagram -- https://www.instagram.com/marshavanw/ About me -- I am Marsha Vanwynsberghe and I am a Speaker, Coach and Author of the Bestselling Book, "When She Stopped Asking Why". I share the lessons as a parent who dealt with teen substance abuse far past the level of normal experimentation. Through my programs, coaching and live events for women (The Inspired Life Project), I am on a mission to teach others how to find their personal power by owning their story, being vulnerable and creating boundaries in their lives. I teach others the tools, tips and strategies to overcome the challenges in their lives. I am on a mission to educate, empower and inspire others to change their story and their lives by taking radical ownership of the choices in their lives. 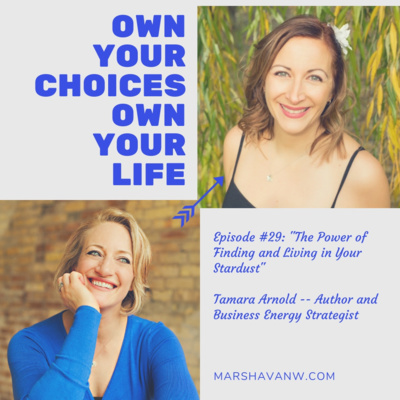 #29: "The Power of Finding and Living in Your Stardust - with Tamara Arnold"
#29: “The Power of Finding and Living in Your Stardust with Tamara Arnold” Tamara Arnold is a two-time international best-selling author, Mamapreneur, Mental Health Advocate, Energy Reader and Spiritual Badass. Creator of the Tea with Tamara podcast, and founder of the The Magical Mastermind, Tamara helps six figure entrepreneurs with spiritual gifts amplify their message to make an even bigger impact in the world. As mama to kids with a variety of mental health issues, Tamara created her business to offer her flexibility and time home with her family, and now helps other entrepreneurs do the same. In this episode we talk about the 1. The power of tuning into our energy and our gifts. 2. Clarity comes with movement and action in our lives. 3. The impact our chakras have on our energy and how important it is to work to clear all the floors. 4. Being open to receiving support, help, guidance and advice from others. 5. Our stories have power and can impact so many others when we choose to show up as our authentic selves. 6. The power of a cord cutting meditation. Tamara gifts us her cord cutting meditation. The link for the cord cutting is here https://www.youtube.com/watch?v=r5vnvFpHvnM&t=43s Connect with Tamara: Tamara’s website: www.tamaraarnold.ca Connect on Instagram: www.instagram.com/tamaraarnoldauthor Connect on Facebook www.facebook.com/tamaraarnoldauthor Connect with Marsha: Book your Discovery Call: https://calendly.com/mvanwyn761 Check out my website - https://www.marshavanw.com/ Connect on Facebook -- https://www.facebook.com.marshavanwynsberghe Connect on Instagram -- https://www.instagram.com/marshavanw/ About me -- I am Marsha Vanwynsberghe and I am a Speaker, Coach and Author of the Bestselling Book, "When She Stopped Asking Why". I share the lessons as a parent who dealt with teen substance abuse far past the level of normal experimentation. Through my programs, coaching and live events for women (The Inspired Life Project), I am on a mission to teach others how to find their personal power by owning their story, being vulnerable and creating boundaries in their lives. I teach others the tools, tips and strategies to overcome the challenges in their lives. I am on a mission to educate, empower and inspire others to change their story and their lives by taking radical ownership of the choices in their lives. #28: “Taming the Monster In Your Head” – Tips to Facing the Monster Head on and Overcoming Its Power. In this “Monday Mindset” episode I share some tips and tools for overcoming the monster in our head. The incessant chatter and negative self talk that hits us when we are faced with a challenge outside of our comfort zone. The frequency this monster reels his head depends upon how often we push ourselves outside of the comfort zone. In this episode we talk about the 1. The power of recognizing the negative chatter that starts the seconds we face our fears, fall into the comparison game with others or we aren’t achieving in the way we feel that we should. 2. Being open to receiving support, help, guidance and advice from others. 3. The importance of creating a mantra, words, or anchor to shift your mindset when you are facing the monster 4. We can change anything when we are committed to facing the monster head on. Connect with Marsha: Book your Discovery Call: https://calendly.com/mvanwyn761 Check out my website - https://www.marshavanw.com/ Connect on Facebook -- https://www.facebook.com.marshavanwynsberghe Connect on Instagram -- https://www.instagram.com/marshavanw/ About me -- I am Marsha Vanwynsberghe and I am a Speaker, Coach and Author of the Bestselling Book, "When She Stopped Asking Why". I share the lessons as a parent who dealt with teen substance abuse far past the level of normal experimentation. Through my programs, coaching and live events for women (The Inspired Life Project), I am on a mission to teach others how to find their personal power by owning their story, being vulnerable and creating boundaries in their lives. I teach others the tools, tips and strategies to overcome the challenges in their lives. I am on a mission to educate, empower and inspire others to change their story and their lives by taking radical ownership of the choices in their lives. The Power of Using Your Story to Make a Massive Impact in the World. Jasmine Rae shares her incredible story with us today. She is a former alcoholic, a future neurosurgeon, youth public speaker and entrepreneur. Jasmine is a Personal Trainer founding Rae of Hope Fitness. She is a Youth Public Speaker for out-patient and in-patient teens in recovery. (currently local to California). She currently offers speaking engagements in recovery facilities, High schools and Middle Schools. Jasmine is here to make an impact and set an example for others the power of changing our story! In this episode we talk about the 1. The power of owning our own choices and taking radical responsibility for creating change in our lives 2. The power of making a decision and getting into action mode. 3. How our story can impact and support others. 4. We can truly only control ourselves. 5. We can change anything when we decide to and are committed to creating change in our lives. 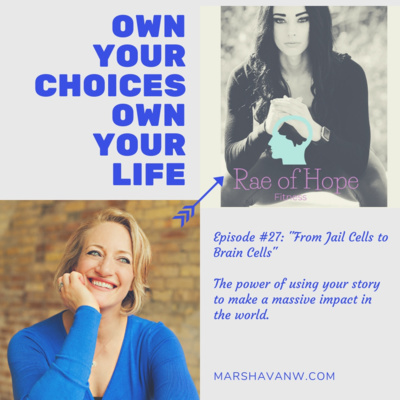 Connect with Jasmine On Instagram: https://www.instagram/jasmine.raeofhope On Facebook: https://www.facebook.com/jasmine.raeofhope Connect with Marsha: Book your Discovery Call: https://calendly.com/mvanwyn761 Check out my website - https://www.marshavanw.com/ Connect on Facebook -- https://www.facebook.com.marshavanwynsberghe Connect on Instagram -- https://www.instagram.com/marshavanw/ About me -- I am Marsha Vanwynsberghe and I am a Speaker, Coach and Author of the Bestselling Book, "When She Stopped Asking Why". I share the lessons as a parent who dealt with teen substance abuse far past the level of normal experimentation. Through my programs, coaching and live events for women (The Inspired Life Project), I am on a mission to teach others how to find their personal power by owning their story, being vulnerable and creating boundaries in their lives. I teach others the tools, tips and strategies to overcome the challenges in their lives. I am on a mission to educate, empower and inspire others to change their story and their lives by taking radical ownership of the choices in their lives. 26: What Will I Carry in 2019? What Will I Carry into 2019?-- Happy New Year!! The New Year is a time of celebration, new starts, growth, expansion and opportunities!! From wrap up letters, to script writing, vision boards, choosing a word for the year and goal setting it can be a little overwhelming for all the things you must do in order to have the new be a success!! What if you don’t have those things done by January 1st, 2019? Did you fail? Do you have any chance for success? In this episode I talk about the 1. One thing you can leave in 2018 2. One thing you will carry in 2019 Let’s keep it simple and set ourselves up for success this coming year!! Tune in for your dash of positivity with realism! Connect with me: Book your Discovery Call: https://calendly.com/mvanwyn761 Check out my website - https://www.marshavanw.com/ Connect on Facebook -- https://www.facebook.com.marshavanwynsberghe Connect on Instagram -- https://www.instagram.com/marshavanw/ About me -- I am Marsha Vanwynsberghe and I am a Speaker, Coach and Author of the Bestselling Book, "When She Stopped Asking Why". I share the lessons as a parent who dealt with teen substance abuse far past the level of normal experimentation. Through my programs, coaching and live events for women (The Inspired Life Project), I am on a mission to teach others how to find their personal power by owning their story, being vulnerable and creating boundaries in their lives. I teach others the tools, tips and strategies to overcome the challenges in their lives. I am on a mission to educate, empower and inspire others to change their story and their lives by taking radical ownership of the choices in their lives. The Power of Stepping into Your Life Lessons with Author and Transformational Coach Kary Odiatu Kary Odiatu is an avid fitness enthusiast. She is a former PE teacher, certified trainer and nutritional consultant. She is the co-Author of: The Miracle of Health and is an IFBB Pro Fitness competitor and fitness model. She has represented Canada in International competition and at the prestigious Fitness Olympia. It wasn't always this way. She was once overweight and came from a family where smoking and alcohol abuse was the norm. Today Kary enthusiastically helps others on the path to transformation with her home based coaching business which also allows her to schedule her time around her 4 children's busy lives. Flip the Script is my mantra. "When you change the way you look at things - the things you look at change" says Dr Wayne Dyer. Connect with Kary: https://www.instagram.com/karyodiatu On Facebook: https://www.facebook.com/odiatu Connect with me: Check out my website - https://www.marshavanw.com/ Connect on Facebook -- https://www.facebook.com.marshavanwynsberghe Connect on Instagram -- https://www.instagram.com/marshavanw/ About me -- I am Marsha Vanwynsberghe and I am a Speaker, Coach and Author of the Bestselling Book, "When She Stopped Asking Why". I share the lessons as a parent who dealt with teen substance abuse far past the level of normal experimentation. Through my programs, coaching and live events for women (The Inspired Life Project), I am on a mission to teach others how to find their personal power by owning their story, being vulnerable and creating boundaries in their lives. I teach others the tools, tips and strategies to overcome the challenges in their lives. I am on a mission to educate, empower and inspire others to change their story and their lives by taking radical ownership of the choices in their lives. 24: "5 Tips to Surviving and Thriving During the Holidays"
5 Tips to Surviving and Thriving During the Holidays -- December tends to be a month of hectic obligations, parties, celebrations, and it can be a month of putting ourselves last. What if there’s a way we can shift our perspective and focus and actually enjoy the holidays? In this episode we talk about the simple tips that I find helpful to put into practice during this busy holiday month. The 5 tips we dive into are: 1. Managing our expectations 2. What do you need? How can you learn to listen to what we need, mind, body and soul? 3. What can you learn to let go of? Especially the things that really don’t matter 4. Learning to stay in the present moment 5. Follow the joy These tips have saved me over the years. I hope you find one helpful tip that makes your holiday season even MORE enjoyable this year! 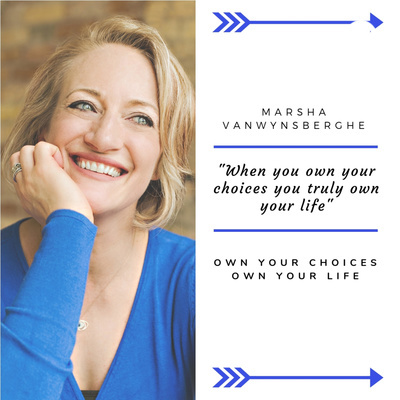 Connect with me: Check out my website - https://www.marshavanw.com/ Connect on Facebook -- https://www.facebook.com.marshavanwynsberghe Connect on Instagram -- https://www.instagram.com/marshavanw/ About me -- I am Marsha Vanwynsberghe and I am a Speaker, Coach and Author of the Bestselling Book, "When She Stopped Asking Why". I share the lessons as a parent who dealt with teen substance abuse far past the level of normal experimentation. Through my programs, coaching and live events for women (The Inspired Life Project), I am on a mission to teach others how to find their personal power by owning their story, being vulnerable and creating boundaries in their lives. I teach others the tools, tips and strategies to overcome the challenges in their lives. I am on a mission to educate, empower and inspire others to change their story and their lives by taking radical ownership of the choices in their lives. In This Episode You Will Learn About: Charlotte Bellis -- The power of following your intuition, self care and embracing surrender. Charlotte is an Online Business Manager, Virtual Assistant, and Mindset Coach who helps women create a life and business that they love. Charlotte helps women to get back to their "why", by working with them to refine their messaging and product offerings. In this episode we talk about the power of using our challenges and our stories to help other women through their circumstances. Charlotte believes wholeheartedly that our stories are the magic ingredient that propels people forward in their life and business. We talk about: 1. How our stories can allow us to turn something painful into a powerful catalyst for others to help them to create change in their lives. 2. Moving toward our goals and dreams is not about arriving, but becoming who we are meant to be. 3. Self-care and putting ourselves at the top of our priority list is required to make any necessary changes in our lives. It always starts here! 4. Learn how to feel safe in the surrender. 5. Sometimes our intuition can direct us in places that don't make traditional sense. Follow our intuition and it will guide the way. Connect with Charlotte Bellis: Website: https://www.myofficerescue.com/ Email: myofficerescue@gmail.com Connect with Marsha: Check out my website - https://www.marshavanw.com/ Connect on Facebook -- https://www.facebook.com.marshavanwynsberghe Connect on Instagram -- https://www.instagram.com/marshavanw/ About me -- I am Marsha Vanwynsberghe and I am a Speaker, Coach and Author of the Bestselling Book, "When She Stopped Asking Why". I share the lessons as a parent who dealt with teen substance abuse far past the level of normal experimentation. Through my programs, coaching and live events for women (The Inspired Life Project), I am on a mission to teach others how to find their personal power by owning their story, being vulnerable and creating boundaries in their lives. I teach others the tools, tips and strategies to overcome the challenges in their lives. I am on a mission to educate, empower and inspire others to change their story and their lives by taking radical ownership of the choices in their lives. Let's talk about December Feels and Focus -- The Power of Reflection and Wrapping up the Year. December tends to be a month of hectic obligations, parties, celebrations, and it can be a month of putting ourselves last. What if we change or tweak the focus of wrapping up the year? In this episode we talk about the power of reflecting on the year, the highs, the lows, the lessons learned, where we found joy and if we used our gifts. We talk about the power of writing ourselves a summary letter of the year and take a closer look at what did we achieve and what do we want to focus on in the coming year ahead. This is an inventory of our past year and it's always important to take inventory before moving forward and setting new goals. Once we write the reflection letter for 2018, ask the following questions: 1. What were the wins for the year? 2. What were the lessons, the take aways? 3. What were the regrets (reframe as choices we didn't take) 4. Where did we find joy? 5. Did we use our gifts? This exercise is a MUST before setting goals for 2019! Connect with me: Check out my website - https://www.marshavanw.com/ Connect on Facebook -- https://www.facebook.com.marshavanwynsberghe Connect on Instagram -- https://www.instagram.com/marshavanw/ About me -- I am Marsha Vanwynsberghe and I am a Speaker, Coach and Author of the Bestselling Book, "When She Stopped Asking Why". I share the lessons as a parent who dealt with teen substance abuse far past the level of normal experimentation. Through my programs, coaching and live events for women (The Inspired Life Project), I am on a mission to teach others how to find their personal power by owning their story, being vulnerable and creating boundaries in their lives. I teach others the tools, tips and strategies to overcome the challenges in their lives. I am on a mission to educate, empower and inspire others to change their story and their lives by taking radical ownership of the choices in their lives. Stop Doing It All - Living with Intention and Upping Your Self-Care Game.